Bramo assai, poco spero, nulla chieggio. 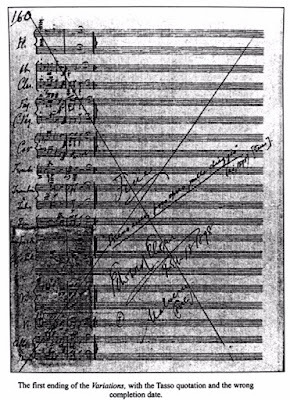 At the end of the original score of the Enigma Variations, Elgar quotes Torquato Tasso’s epic poem Jerusalem Delivered (La Gerusalemme Liberata). The quote as shown in the epigraph is followed by "(sic, 1595)," the name Tasso in brackets and the translation on the following page. There are several anomalies associated with Elgar’s use of literature in this instance. First, the quotation is modified from the third person to the first. The third person as written by Tasso is, "Brama assai, poco spera e nulla chiede." Second, 1595 is not the year when Tasso wrote Jerusalem Delivered, but rather the one in which he died. Third, the translation is partly inaccurate because it should read "I desire much'" rather than "I essay much." It is insightful to observe that the Tasso quotation consists of six words in a foreign language for those like Elgar whose native tongue is English. It is more than mere coincidence these two elements are also associated with the unstated Principal Theme (Ein feste Burg ist unser Gott), a title made up of six words in a foreign language. The change from the third to first person further alludes to the numbers 3 and 1, or more likely the inverse found in the title of Variation XIII. By quoting Mendelssohn's overture Calm Sea and Prosperous Voyage in Variation XIII, Elgar draws attention to Goethe, a poet who composed the play Torquato Tasso. On the eve of being crowned the king of poets in Rome by the Pope in 1595, Tasso died at the age of 51. When near death, Tasso told Cardinal Cinzio, "This is the crown with which I hoped to be crowned. It is not the glory of the poet's laurel, but the glory of the blessed in heaven." It is remarkable General Gordon also died at the age of 51, bolstering the conclusion Variation XIV is indeed linked to that Anglican warrior-evangelist so deeply admired by Elgar. Considering Elgar’s careful use of literature, it is completely out of character for him to paraphrase a famous literary source, give by the wrong year and furnish an inaccurate translation. With so many deliberate anomalies, Elgar clearly intended to draw attention to Tasso. The deeper question is why? Following my discovery of the Romanza cipher pinpointing the Turin Shroud as a source of inspiration for the Enigma theme, Elgar’s Tasso quote takes on a whole new level of significance. In 1578 the Shroud was taken from France and delivered by the Duke Emmanual Philibert to the city of Turin. 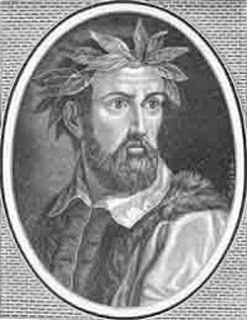 On that day Turin was host to a very famous guest: Torquato Tasso. When a special Mass was given the next day to celebrate the arrival of Christendom’s most sacred relic, Tasso was among those present to receive Communion. When the Exposition of the Shroud was given, Tasso venerated the relic by kneeling before it, weeping and kissing it over and over again. 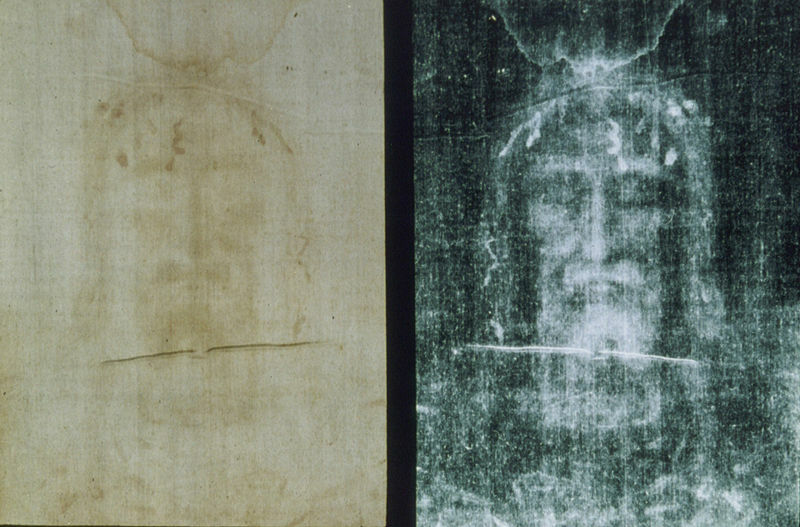 It is an undeniable fact that Tasso and the Shroud of Turin are inextricably linked. Understanding the special connection between Tasso and the Shroud of Turin underscores Elgar’s purpose for drawing attention to Tasso and his most famous work, La Gerusalemme Liberata. At the conclusion of that epic Christian poem, the knight Godfrey of Bullion liberates Jerusalem from pagan occupation, sheds his armor and worships at the Holy Sepulcher like a humble pilgrim fulfilling a sacred vow. 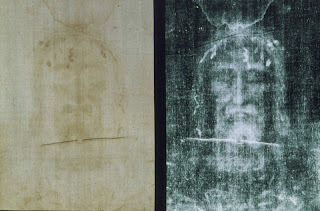 This is the very place where many believe the Shroud was miraculously transformed at the moment of the resurrection to capture a photographic negative of the body and face of Jesus. Secondo Pia took the first photographic negative of the Shroud of Turn in 1898, a little less than six months before Elgar began work on the ‘Enigma’ Variations. The timing is too compelling to be ignored. This famous photographic negative was widely reported in both Catholic and secular media, and copies were distributed extensively among the faithful who wished to gaze on the face of their Savior. Elgar, a committed Roman Catholic, was surely aware or this famous discovery and moved by the secret image brought to light by modern photographic technology. 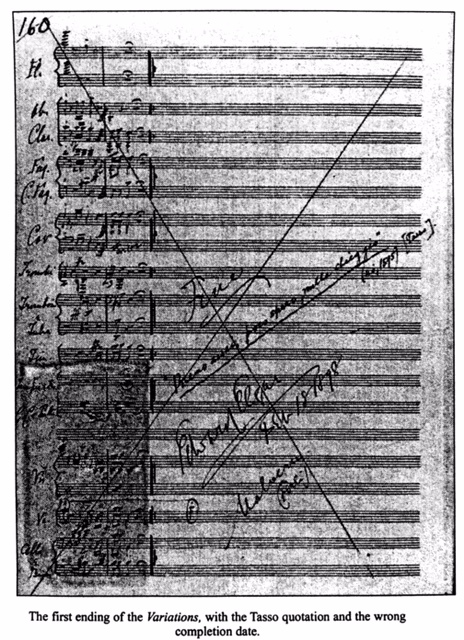 In light of this analysis, Elgar’s Tasso quotation serves as a special clue concerning the hidden inspiration to the Enigma Variations. Just as the Shroud concealed the image of a famous personage, so too does the Enigma theme conceal using an ingenious counterpoint a famous melody, one that celebrates the very same person by name: Christ Jesus. He is certainly the hidden friend of Variation XIII, one whose initials were openly hidden (X = J, III = C). With the secret of the Enigma Variations being so sacred in character, is it any wonder secular scholars stumbled in the darkness of their own ignorance, groping and bumbling in vain for some other explanation? The scholars could no more unravel Elgar's enigmas than the wise men of old could discover and interpret King Nebuchadnezzar's mysterious dream. To learn more about the secrets of the Enigma Variations, read my eBook Elgar’s Enigmas Exposed. Like my heavenly Father’s gift of salvation, the price is free.